With the New Year, we’ve been looking back at the past to try to come up with some good New Year’s Resolutions. Unfortunately, in retrospective, the realities of the past few economic years do not offer very promising pictures for the economic future for US Middle Class. Read the Full Article chock full of fun facts at: 1%’ers Get More Bonuses: Increased Annual Income and Bank Regulators Ease Bank Liquidity Requirements. As average Middle Class income was falling, the average single-year pay increased by 11.6 percent for the wealthiest 1% households in just 2010. 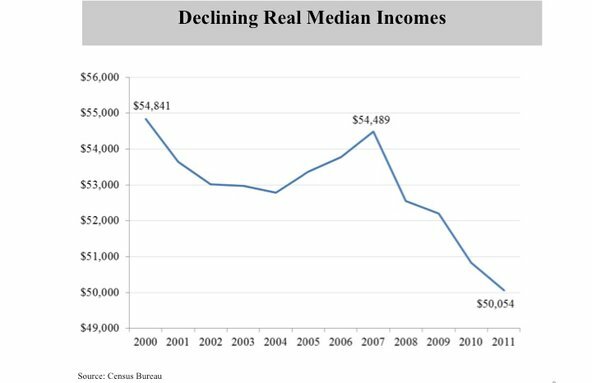 The top 0.1%‘ ers saw their incomes rise by 21.5 percent in just that 2010 single year..
Nice, eh… Middle Class income falls by 10% and … . . .
Why do Middle Class people pay 58% higher tax rates than the wealthy? Resolution: RAISE TAXES even more on those who have NOT paid anything near their fair share for 30 years…. Resolution: Write your Congressman and Senators to CUT GOVT SPENDING. Resolution: GET THE US TROOPS OUT of Italy, Bosnia, Kosovo, Germany, Afghanistan, Korea etc… Let them solve their own problems. Stop spending 100’s billions on the US Navy to keep cheap oil supplies flowing to China, Japan, Korea, Indonesia, and Taiwan. Resolution: Let them pay to defend their own oil…. US taxpayers also pay to benefit big international companies and foreign govts., while we accumulate bigger and bigger deficits that our children and grandchildren will have to pay, … all so the US wealthy can have basically the lowest tax rates in the industrialized world. Resolution: Stop bankrupting the US treasury to reward the rich. Resolution: Stop trying to be the world’s policeman. You have many good and informative articles for the expat….stay away from politics & religion please..
Sharp Readers do notice that you offer zero facts and no figures to support your claims. We have presented official US Census economic figures and IRS reports for income and taxes paid data, and official CBO figures on past deficits, all as primary sources, and we for current/recent reports, we quote factual reports and figures from Bloomberg financial news – all of which are considered unbiased and reliable by most ordinary folks. e.g. The figures presented above are neither Left Wing/Socialist nor Fox News opinions or Limbaugh-spun creations – but instead, these are straight-up, no-spin data from the official sources. Just which of these official statistics are “crap“? Just which of them are “half * truths“? Just where is there any “religion” mentioned in the article? It just might be that you consider these economic issues to be a part of your “religion“? For us: Economic facts are not religious issues. Further: We advocate using facts when analyzing realities vs. name-calling and smears. When did calling someone’s factual presentations of official data “spreading Crap” and “pure BS” , somehow become “submitted respectfully” ? ~ Budgeted Non-Afghanistan / Non-Iraq US military spending has been at roughly $400 billion a year, plus an additional $400 – $450 billion a year in off-budget spending, since the 2001 Bush tax cuts. ~ The Pentagon’s 2010 Base Structure Report, lists 4,999 total military installations in the US, its territories, and overseas. No military in the history of the world has been more widely deployed as the United States. The US has troops in 75% of the world’s countries. An interactive map at http://www.vetfriends.com/US-deployments-overseas/historical-military-troop-data.cfm shows the official Pentagon numbers. Other big deployments: 110,000 in Afghanistan, 122,000 in the USA, and even though we have “gotten out of Iraq”, we still have 92,000 troops there. ~ 1,414,000 (1.4 million) US Total Active Duty Troop Levels as of December 31st, 2011, not including National Guard troops. *Do readers like/support that the US has 10X more troops than other nations? **Do readers see any irony in the fact that at the same time that Republicans cut taxes, that they spent the same amount in off-budget “wars on terrorism” as the $6 trillion in growth of the Public Debt? *** Do readers find even 662 overseas US military bases reasonable? ****Do readers consider it necessary to maintain over 118,000 US military personnel based in friendly nations, who are at peace with all their neighbors? There will be $250 billion spent on interest to pay the debt, which makes roughly $3 trillion of 2013 federal spending on the US Military, pensions, Health Care, and Debt service, out of $3.8 Trillion total. ~ Cut pensions (including military pensions and SSI) – which is unacceptable to most people. ~ Cut guaranteed interest payments on our debt – not allowed legally. With the existing 120,000 military personnel in friendly safe countries like Germany, England, and Italy, do reasonable people really believe that military cuts are not possible or reasonable? Even if we completely eliminated US federal health care spending ($900 billion), we cannot balance the budget without cutting the Military or raising taxes. As pointed out in the article, Middle Class folks have been paying an average of 58% higher tax rates than the wealthy (2%’ers) for roughly a decade – which could mean it is time for the wealthy to pay their fair share. Any alternate proposals on where else to make the cuts??? The economic facts point to Military spending as the most productive area to make cuts, causing the fewest economic impacts?? ?